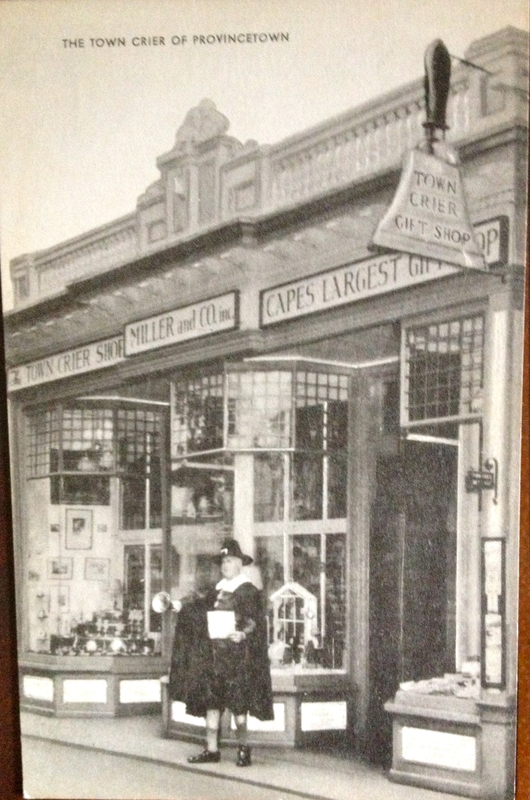 This antique postcard shows the Town Crier Gift Shop. Provincetown, Massachusetts has always been a mecca for shopping. It’s one of the busiest towns on the Outer Cape. This postcard shows 265 Commercial Street, when it was the Town Crier Gift Shop. Prior to that time, this location was the home of the Advocate Gift and Souvenir Shop according to John Wright Hardy the author of Provincetown Vol. I. The gentleman in the pilgrim outfit standing outside the shop, which boasts itself as being the largest gift shop on Cape Cod, was not the official Town Crier for the town of Provincetown but was hired by the store to attract business. His name was Charles Walton. To learn more about Town Criers in Provincetown read some of our previous postings. To be entertained by a Provincetown mystery story read Remaining in Provincetown , available at bookstores and online in trade paperback and as an ebook. Like us on Facebook and keep the conversation going.